Shakespearean trained versatile actor David Suchet has spent over twenty years sleuthing on the small screen as Agatha Christie's Hercule Poirot, bringing the author's thirty-three novels and fifty-one short stories that revolve around the Belgian detective to life. And as we near the conclusion of ITV's long-running series which has also become a fixture on PBS' Masterpiece Mystery, it's been fascinating to notice the way that as a man and a performer, Suchet has astutely and subtly begun showing us new shades of the man we thought we knew so well as the adaptations have evolved and the years progressed. For while the impossibly stuffy and slightly sexist Poirot will always remain the president and most important member of his own ego-driven fan club, in three of the most recent and mostly superb made-for-television mysteries, we find Suchet's Poirot facing far more complicated moral, spiritual and existential crises regarding when to bring people to justice and if the punishment fits the crime. Of course, luckily for the viewer, he's still prone to talking about himself in the third person and always a stickler for OCD details like requesting two eggs for breakfast that are precisely the same size while on a fast paced train hurtling along the Orient Express. Yet Poirot nonetheless discovers that at times, just coming up with a killer denouement for his drawing room speech may not be enough when taking into consideration what will happen to those he names as accomplices and criminals once he walks away. In Orient, which is arguably Poirot's most famous case, that's been adapted for the silver and small screen a handful of times including Sidney Lumet's acclaimed 1974 Oscar winning work starring Albert Finney, Suchet gets his chance to tackle the notorious caper. Using two other tragic incidents as an unorthodox yet thematically vital “prologue” to the main case, director Philip Martin's startlingly dark yet technically superlative handling of the revered source material manages to rivet us all the same thanks to stellar production values and a thrilling score. However, one of the recurring problems of the three titles included in the boxed set that also includes The Third Girl and Appointment With Death is that it takes awhile for each of the works to build up enough momentum whether it's due to the other cases that foreshadow Orient or because they attempt to acquaint us with far too many unlikable characters in the confusingly written Appointment. Yet while the moral throughline of Murder makes the initially bizarre introduction to the main murder pay off considerably well later on, ultimately the final Appointment in the set doesn't manage to garner our empathy and interest until Poirot's masterful explanation of what exactly happened out in the desert during a deadly archaeological dig. Faring the best in the bunch is The Third Girl, thanks to not only a uniformly excellent turn by Suchet who shows us the softer side of Poirot by actually letting a tear of happiness roll down his cheek in the final shot but also due to the charisma of actress Jemima Rooper whose character Norma tracks down the detective upon the suggestion of her neighbor, the bestselling author Ariadne Oliver. Devotees of the ITV cases will easily recall that anytime Ariadne Oliver turns up to pay a visit to her old friend Poirot, the cases are all the better for it, not only because of the Christie alter-ego's delightful and sometimes wicked sense of humor and female intuition but also because she never fails to bring more adventure and danger to the otherwise stodgy Poirot. Just one of several excellent roles embodied by notable guest stars including Toby Jones, John Hannah, Elizabeth McGovern, Barbara Hershey, Hugh Bonneville, Peter Bowles, Eileen Atkins, Tim Curry and James Wilby, the talented Zoe Wanamaker ratchets up the tension and charm quite considerably as the incorporable Ms. Oliver. Admittedly at times it looked as though the roughly ninety minute works were relying on either green screen technology or far too many special effects – particularly in Appointment -- both for the locales as well as some suspenseful touches of trickery. 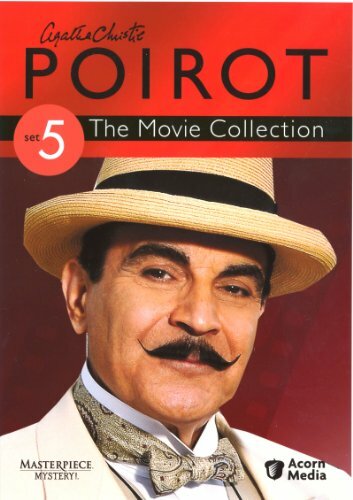 Yet overall the works are first rate, adding a more polished and smoother cinematic feel to the Poirot landscape to ensure that new fans can look past any preconceived prejudices about pretentious period dramas or literary mysteries and just get lost in a good book brought to the screen by Suchet and company.